I usually recommend DIY solutions, but I never found a good one for this. If you just put one bottle on top of the other, you’re likely to have overflow. Or, worse, the bottles topple over. I’ve tried taping bottles together, but then getting the tape off can cause you to accidentally squirt lotion everywhere. These lotion couplers I bought at Container Store for a few dollars saved me enough money to justify the cost in the first year. And they are so much better, cleaner and simpler than any DIY solution I’ve found. Here’s a look at how they work. 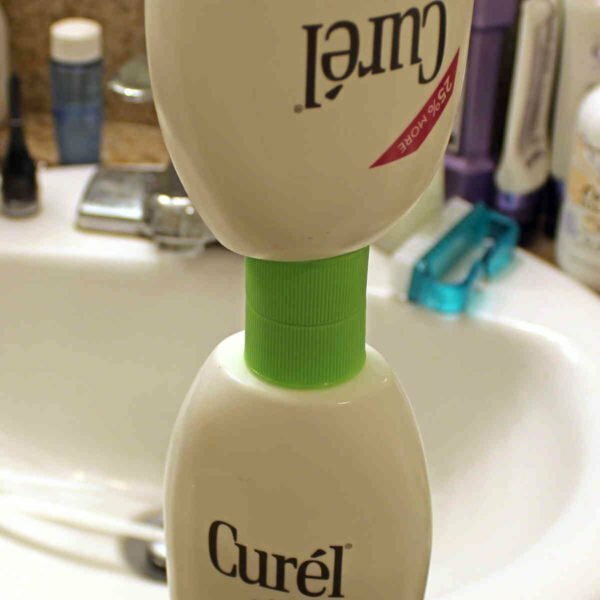 I wanted to combine two bottles of Curel, one nearly empty and one nearly full. I took out the pump lids and laid them in the sink. 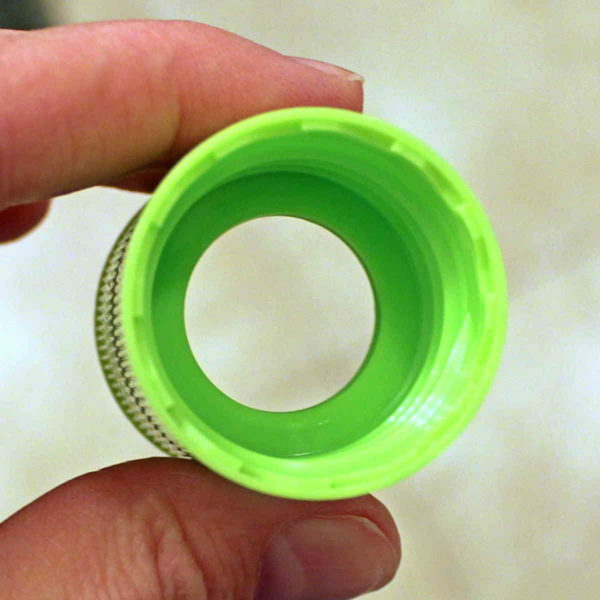 Now, the lotion coupler itself is a tube with grooves at both ends. 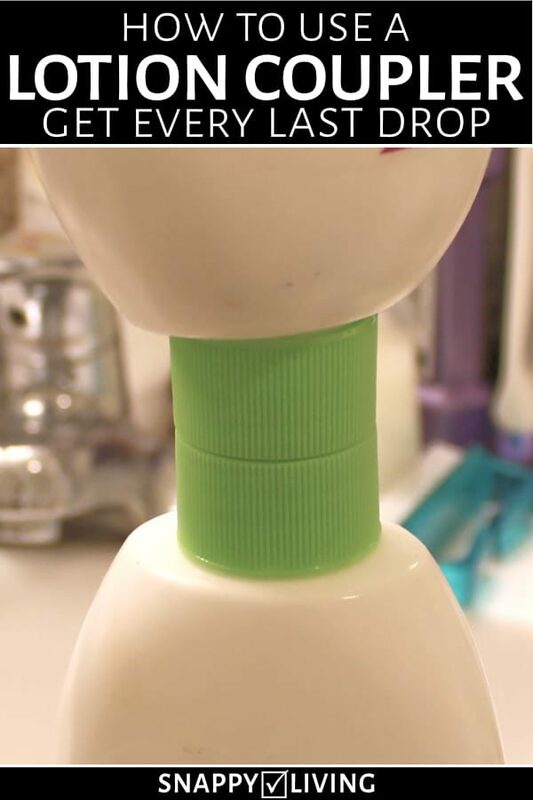 This lets you screw two bottles into either end of it. The package includes two sizes of couplers, plus one coupler with a large end and a small end. That lets you combine bottles that aren’t the same size. I screwed the coupler onto the bottle that’s mostly full. Then I turned up the less full bottle and screwed it securely into the other end. 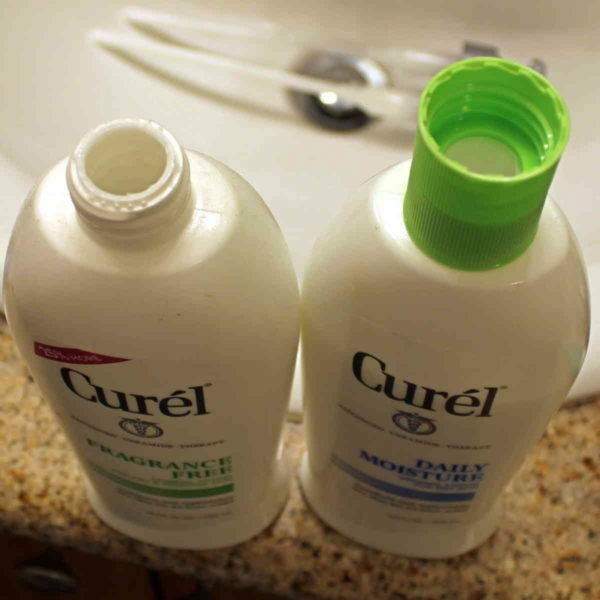 If you’re doing this with a more runny lotion (Curel is really thick stuff), just turn the bottles on their side to minimize spillage. If you work quickly, it’s all going to get caught in the coupler anyway, and eventually run into the bottle where you want it. I left it alone for a while – it did take some time to drip from bottle to bottle. 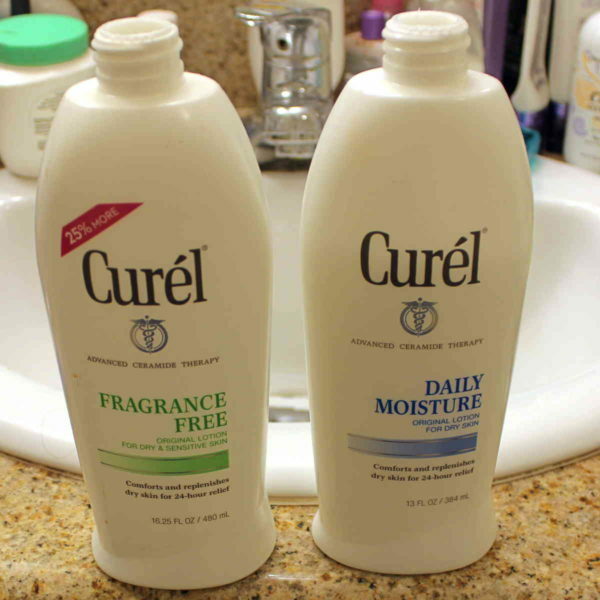 In the end, because Curel is so thick, I had to pick up the coupled bottles and give them downward shakes. But the thing about these lotion couplers is, you can’t go wrong. When I tried to do all these moves without them, stuff got all over the place and product was lost, and I had a mess to clean up. With the couplers, that’s not going to happen.Easy-peasy! What used to be a messy and annoying task that often went wrong is now really easy. These little couplers are a brilliant idea – so simple, but just exactly what you need.